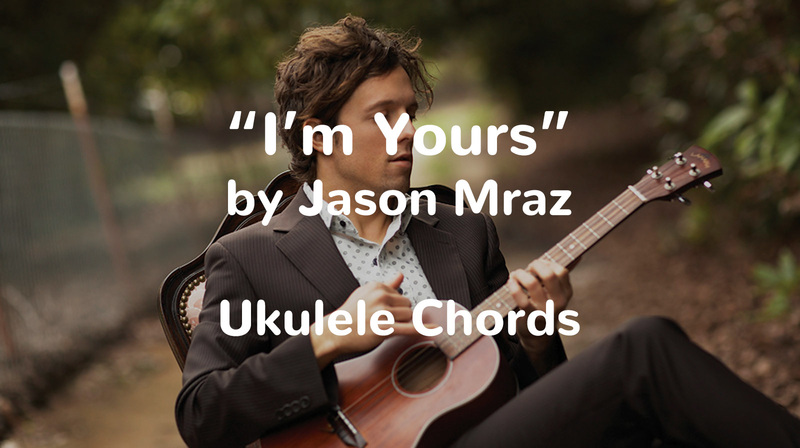 If there’s one song every ukulele player needs to know, it’s Jason Mraz’s I’m Yours on ukulele. With laid back vibes that make you feel like you’re strumming on the beach somewhere in Hawaii, this song is fun to play. Learn how to play Jason Mraz’s with the ukulele chord diagrams and chart below and get some tips on the strumming you can use to play this song. This song is originally recorded in the key of B major but sometimes for live performances Mraz will lower the key a half step or two to make it easier to sing. I find it’s much easier to play and sing when it’s lowered a half step to the key of Bb major. To help you find the right key for your voice, I’m going to first include the chart for the original key, and then, I’ll include another chord chart for the key of Bb and A. Use the Ukulele Tricks chord library to look up these chords and get the chord diagrams. Listen to I’m Yours to hear how this song sounds before you play it on your ukulele. As you’ll hear in the video, Jason Mraz uses a muting technique for his strumming on the guitar. We can replicate this on the ukulele by playing a down-up eighth note strum while accenting beats 2 and 4 of the measure. If strumming is a mystery to you, join me in the free four-lesson Learn to Play Ukulele Today video course. Ha, I love that kid! I strum this but muting the strings, playing eighths and letting the strings ring on the beats. i absolutly LOVE this song! I don’t quiet know how to play it yet though because i just got a ukulele for Christmas. Do you feel that a 13 year old girl will be able to play this song? Totally! If you haven’t already, download my free ukulele lesson book. That’s a perfect starting point. Eventually, you’ll be able to play this song! I love this song! I got a ukulele for Christmas and am learning to play this song. I wasn’t really sure about the strumming patterned so I googled it and found a few. The one i use to play this song is up-down-up-mute and it sounds really cool! thanks so much! Where can i download your free ukulele lesson book from and what are all the notes for the song( i have trouble with reading music sheets)? Hey Bob, if you sign up for the email list, I will send the free book to you! If you haven’t received it yet, send me an email through my contact form and I can help you out. I think you will find my ukulele lesson book to answer your second question. Again, let me know right away, if you don’t get it to your email after you subscribe. What is the strumming patter? I am Mila a mother of 5th year old boy, Alif – we are in Indonesia. Alif likes ukulele when he saw some kids play it. This will be his first music instrument. I search “how to play ukulele” and found your site. Thank you so much! Hi Mila, welcome to you and your son! Please enjoy my lessons! Stayed up way too late and played my fingers raw trying to figure this out last night. And now I know why I have reading traditional music for my uke fries my brain… that darn G string really screws with my head after years of violin. Need to explore that low G tuning! Sounds like you’re hooked, Doris! 🙂 Definitely explore that low G tuning. Especially if you are digging into traditional or written sheet music. Do you offer any courses on finger style ukulele? I would love to play a finger style version of this song.